A new €9.8m bridge opened today over the Royal Canal and the Maynooth railway line should give people cycling between Cabra and Finglas their own space and will also allow for the Dublin to Galway greenway route. The bridge replaces the now-closed Reilly’s Level Crossing which was on a narrow bendy section of road. It was described by Irish Rail as “one of the busiest manually operated rail level crossings” on the national rail network. 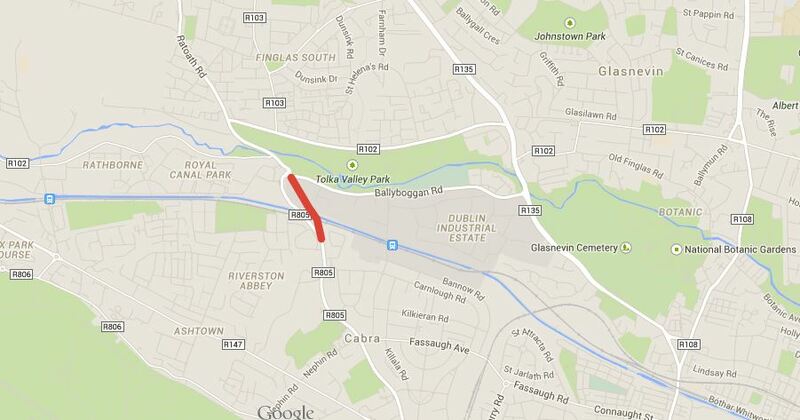 The opening will mean that the towpath route along the Royal Canal — which will eventually form part of the Dublin to Galway greenway — will no longer have to cross a heavily trafficked road on a bend. There is also a ramped access point to the canal from the north west side of the bridge. The Maynooth railway line is planned — as part of the wider Dart Underground project — to be upgraded to handle Dart trains, powered by overhead wires. A number of level crossing on the route are planned to be closed. The bridge was built by Irish Rail and Dublin City Council, with funding from the National Transport Authority.